Amidst the blustering winds of the wild Auckland Harbour this afternoon, us Kiwi Bottle Drive folks stood alongside Greenpeace New Zealand, as oceans campaigner Emily Hunter launched an action plan to tackle plastics. 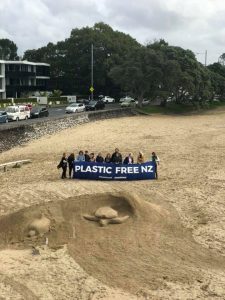 Amazing volunteers and an artist had sculpted a gigantic turtle in the sand and we all held a banner up together, reading “Plastic Free NZ”. It felt like the perfect way to launch something as ambitious as this; a step-by-step plan to help this country break free from plastic, featuring, of course, yours truly – bottle deposits. You can read about the plan here and you’ll see our campaign to get bottle deposits is number two on the four-point plan to tackle plastic. The strategy was formed after months of research and crowd-sourced planning. Emily, who spearheaded the project, consulted with experts from across the waste sector, including Warren Snow, author of a well-known report on container deposit schemes (bottle deposits) and founder of our organisation. Putting the pieces together, Emily and her team came up with an all-encompassing strategy which identifies four steps New Zealand needs to take to traverse the messy world of plastic pollution and emerge on the other side a plastic-free, more beautiful and healthy nation. Bottle deposits: let’s get them. Full stop. More on this – so read the whole plan, go on! We are proud to support this simple, comprehensive and ambitious plan. We need the government to adopt it as soon as possible so we can get on with the job of making where we live beautiful; for our communities and for our oceans.